Info Melvin Eugene "Mel" Carnahan (February 11, 1934�October 16, 2000) was an American politician who was Governor of Missouri from 1993 to 2000. A Democrat, he died in a plane crash during a campaign for the U.S. Senate. Carnahan was born in Birch Tree, Missouri. His father was A.S.J. Carnahan, 8th District Congressman from Missouri for eight terms. Mel Carnahan graduated from high school in Washington, D.C., and earned a BA in business administration from George Washington University. He entered the United States Air Force, rising ultimately to first lieutenant, and served as a special agent for the Office of Special Investigation. He received a J.D. degree from the University of Missouri School of Law in Columbia, Missouri, in 1959. In 1980, Carnahan was elected Missouri state treasurer. He served in that post from 1981 to 1985. In 1988 he was elected Missouri lieutenant governor. In 1992, he faced Saint Louis mayor Vincent C. Schoemehl in the Democratic primary for governor. He was elected as governor of Missouri on November 3, 1992 and re-elected for a second term on November 5, 1996. In 2000, Mel Carnahan ran for U.S. Senate, opposing the incumbent Republican, John Ashcroft. It was a heated, intense campaign in which Carnahan traveled all over the state to garner support in what was a very close race. Late on October 16, 2000, just three weeks before the election and the night before a presidential debate to be held in St. Louis at Washington University, a twin-engine Cessna airplane piloted by the Governor's son Randy Carnahan, crashed on a heavily forested hillside near Goldman, Missouri, about 35 miles south of St. Louis. All three occupants of the plane�Governor Carnahan, his son Randy, and Chris Sifford, campaign advisor and former chief of staff to the governor�died in the crash. Carnahan preceded Senator Paul Wellstone and followed Senator John Heinz and Congressman Jerry Litton in dying in plane crashes during Senate campaigns (in 2002, 1991, and 1976 respectively). 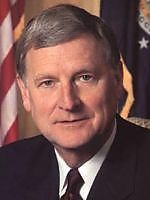 Early on October 17, 2000, Lieutenant Governor Roger B. Wilson succeeded Mel Carnahan to fill the Governor's office until January 2001. Because Missouri election law would not allow for Mel Carnahan's name to be removed from the November 7, 2000 ballot, Jean Carnahan, his widow, became the Democratic candidate unofficially, with acting governor Wilson promising to appoint her to the senate seat if it was vacant as a result of Mr. Carnahan being elected, and the campaign continued using the slogan "I'm Still For Mel." Mr. Carnahan won, giving future Attorney General Ashcroft the unusual distinction of losing an election to a dead man. Mrs. Carnahan was then appointed to the Senate and served until, in a special election in November 2002, following another heated campaign, she was defeated by James Talent, a Republican.